Central blood pressure is closer to the heart, coronary and carotid arteries, which are the most important sites of cardiovascular events. The influence of cyclic stretch (owing to cyclic changes in blood pressure) on the arterial wall has been documented at every stage of atherosclerosis development. Apart from mediating atherosclerosis progression and plaque instability, the pulsatile component of blood pressure is the main mechanism leading to plaque rupture and, consequently, to acute coronary syndromes and other vascular complications. A number of studies reported a significant relation between central blood pressure and the extant of coronary atherosclerosis as well as between central blood pressure and cardiovascular risk in patients with coronary heart disease. A lot of attention has been given recently to break the link between pulse pressure and cardiovascular events. 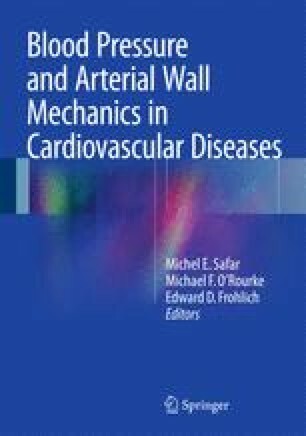 Because of the vicious circle consisting of arterial wall stiffness, pulse pressure, and atherosclerosis, the most promising intervention is reduction in arterial stiffness, although increase of the potential benefit requires interventions aiming at all three components of the vicious circle.